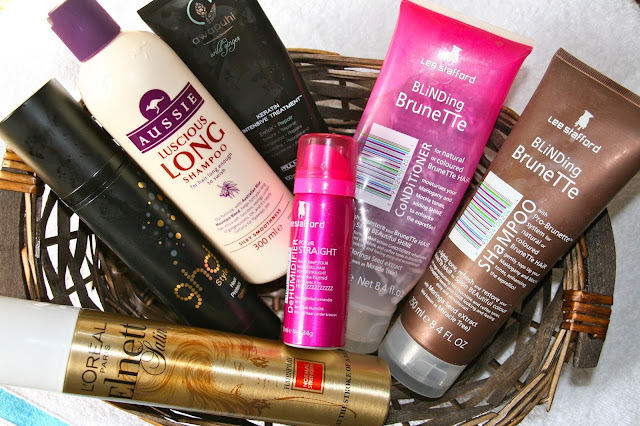 Today's post features some of the haircare products that I've used up in the past few months. I say "some", because my hair is so long it feels like I'm tearing through my haircare stash! This shampoo from Aussie is formulated with Australian Blue Mountain Blend which is supposed to help turn your long hair into gorgeous tresses. Australian Blue Mountain Blend is not a type of coffee, but a mixture of two different kinds of Eucalyptus extracts. The shampoo is pale blue and smells absolutely delicious (nothing like Eucalyptus, don't worry). My hair feels clean yet nourished. I can't fault this shampoo and will definitely be repurchasing it. When I cut my hair last year I needed a hairspray that could keep my curls curly all day as well as not making them feel crispy. The L'Oreal Elnett hairspray was recommended to me and I haven't looked back. It's a big can and, depending where you buy it and if you wait for sales, doesn't even cost R60. Sure, it doesn't smell very fruity or delicious, but it does what it needs to. The mist is super fine and my hair stays in place the entire day without ever feeling crunchy or crispy. I have repurchased this a few times, I think I might be on can number three! I bought this little can as part of a 3-for-2 special at Clicks, and I was pleasantly surprised. Each time we've gone to Cape Town I packed this and frizz never got me down. It feels and smells like a normal hairspray, and you use it as such, but it does a little more than that. I think I will repurchase this again, but I'll only stick to the small bottle seeing as I only use it in places where there's a real chance of frizz. I used this after towel drying and before blowdrying to protect my hair against heat damage. The mist is reasonably fine and it smells nice. I can't say if it does protect my hair, but my hair does feel softer after blowdrying, so I can definitely say that it does *something*. I might repurchase this, unless I find something more affordable. This is a thick white cream that you apply to clean wet hair and leave on as a mask for 3-5 minutes. It's supposed to enrich and repair the hair. Now, at the time I used it my hair was in a pretty good condition, so it didn't feel like this treatment really did anything. It was a nice weekly mask, but I couldn't see any difference in my hair. I don't think I'll be repurchasing this. I have to admit, I was drawn to the name of this one. The shampoo and conditioner both smell very nice, but what freaked me out is the shampoo. The shampoos I am used to are quite thick, and are varying shades of white or cream. This shampoo was as runny as water and it was a dark chocolate brown. You don't even know how horrific my shower floor looked every time I used this! It lathers up nicely and cleans my hair, but the texture and especially the colour really freak me out. The conditioner, on the other hand, has a white creamy texture and is lovely and rich. All in all these two are OK, but nothing to write home about. There are other shampoo and conditioner combos that are cheaper and work better, in my opinion. I won't be repurchasing this. Which shampoos and conditioners have you recently used up and what did you think of them? Let me know in the comments section!